Spicejet has announced that they have overtaken Jet Airways to become India’s second largest airlines company. This is the first time in India aviation history that Spicejet has climbed to #2 spot, and for the first time Jet Airways (and Jet Lite) have descended to #3 rank. If we compare the infrastructure of both the airlines, then on one hand Jet Airways operates 3000 daily flights from 76 destinations all over the world; SpiceJet is operating only 350 daily flights from 48 Indian and 10 International destinations. But a strong branding campaign, along with superior customer care service and sticking on with low-cost airlines mode of operation has helped SpiceJet to increase it’s market share exponentially since last few years. For instance, last year, SpiceJet announced their occupancy levels of 81.4%, which was the highest among all airlines. 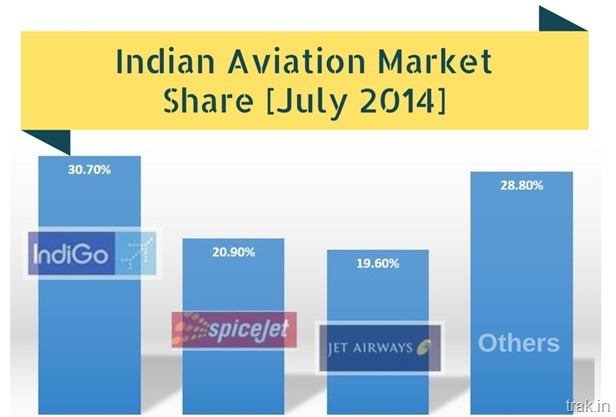 In March this year, they had a market share of 17.8%, which has now crossed 20% and helped them beat Jet Airways. However, revenues of SpiceJet, like all existing airlines companies is not increasing despite excellent services and increased market share. For the period April-June, 2014, SpiceJet reported loss of Rs 124.10 crore, which is their 4th straight quarterly loss. Revenues for this period also dipped to Rs 1678.59 crore. With the entry of low cost airlines Air Asia and Tata Vistara into the Indian airspace, the competition is all set to become even more intense. With the festival season approaching fast, consumers can expect some big time discounts and flash sales from airlines companies to lure them into their seats. DGCA Stops SpiceJet From Selling Tickets At Re 1; Terms It Malpractice! Jet Airways Brings Flight Updates With Google Now Integration!